We decided a few weeks ago that on Mondays we would serve a vegetarian dinner and call it Vegetable Monday. I am sure our 30+ days of high calorie, nutritionally-void holiday food and tight jeans may have inspired this grand proclamation, but I’m kind of digging it. This replaces our once popular Pizza Monday, so you can imagine how the kids feel about this. They probably refer to it as Arsenic Monday behind our backs. This comes from one of my favorite cookbooks, Moosewood Restaurant Cooks at Home. I am modifying it a bit tonight for our meal, but I will share the original version first, and then my adjustments. My kids like broccoli and peppers, so I threw them in there. They also like rice instead of rice noodles. And, oh, did I mention they won’t eat the sauce? Basically, I’m just making this for Ed and myself. Don’t be put off by the name. “Fragrant” somehow doesn’t feel like a good food word to me, although it is certainly evocative. Fragrant is too close to fragrance (i.e. perfume or Glade air freshener), and that’s not something I want in my food. Plus, this is peanut based, but you’d never know it from the name, would you? This sauce is a winner. I always double it, since Ed prefers his food drowning in sauce, but I seriously don’t suggest doing that unless you have sauce addiction issues like my husband. I also like to add a bit of crushed red pepper for some heat, just a 1/4 to 1/2 teaspoon. As you can see below, we used two different blends of veggies (Vegetable Monday, was I lying?). I love this recipe with rice noodles or pasta, but it works equally well with plain old rice, too. In a covered pot, bring the water to a rapid boil. Combine the sauce ingredients and mix them by hand or puree them in a blender until smooth. When the water boils, add the noodles and cook for 3 to 5 minutes, until just tender. Drain, rinse briefly under cool water, drain again, and set aside. Cut the leeks, zucchini, and yellow squash into sticks 5 to 6 inches long and 1/4 to 1/2 inch wide. Heat the oil in a wok or large skillet. Stir-fry the leek sticks on medium-high heat for 2 to 3 minutes. 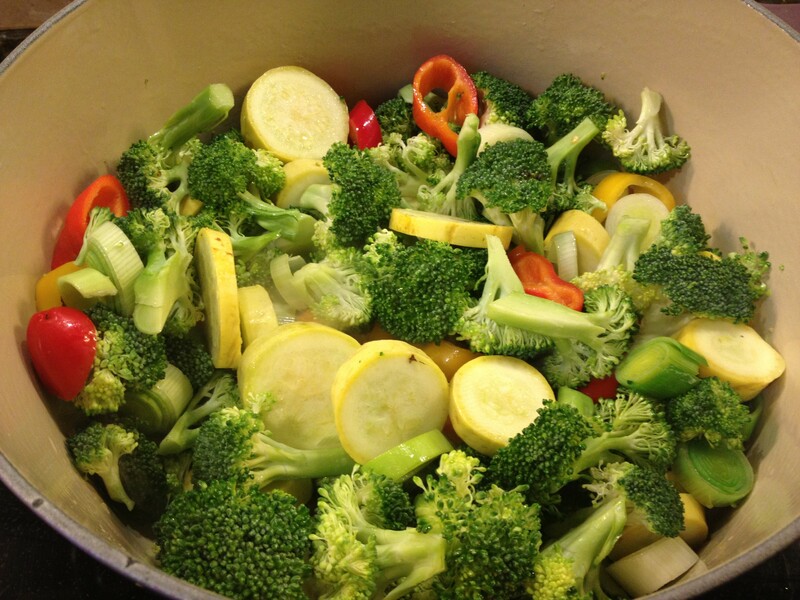 Add the zucchini and yellow squash and continue to stir-fry for about 3 to 4 minutes, until the vegetables are just tender. 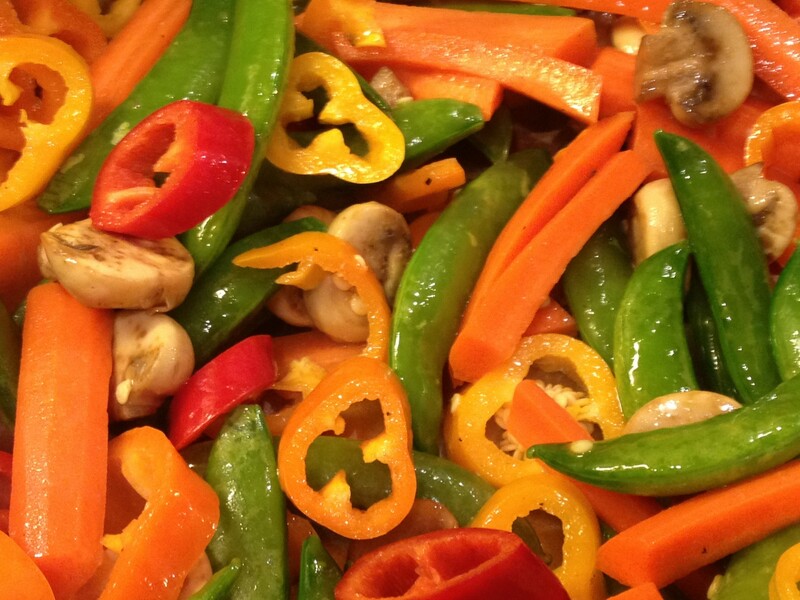 To prevent scorching or sticking, add about 1/4 cup water while stir-frying. Add the noodles (or pasta) and the sauce and toss well until heated through. Serve at once. This entry was posted in Main Dish and tagged fragrant rice noodles with vegetables, vegetarian by Mom Mom's Apron. Bookmark the permalink. thanks for reminding me about Laurel’s wonderful peanut sauce! Mmmmm…..